The best ultrasonic cleaners can clean just about anything. Maybe you’re here because you want to find a way to get your jewelry nice and clean. Or, maybe you’re looking for the best ultrasonic cleaner for guns. Either way, you’re in luck. Here, you’ll find both jewelry cleaner and ultrasonic gun cleaner reviews and more. Before we get started, let’s take a look at some of the key features you should keep in mind while you shop. Capacity: This is how much water the machine can hold which directly affects how much stuff it can clean at once. Think about what and how much you want to clean then decide how much space you need. Cleaning Settings: This is nothing more than how long the cycle runs. Some of our picks have presets that let you pick different lengths that range anywhere from 30 to 600 seconds. Other have only one cycle. Material: The tanks of these machines are all made of stainless steel. That said, the outside varies. Some are also stainless steel while others are made of plastic. The outside is mainly cosmetic so choose one that you like the looks of. Frequency: Frequency is measured in Hz which is basically vibrations per second. These vibrate so fast that the human ear can’t even hear. Effective ultrasonic cleaning requires about 40,000 Hz, all of which these picks deliver. Size: The size is how big a footprint the machine has. This is a good thing to keep in mind if you’re looking for something to keep out on your counter or when considering how much storage space you have. Warranty: The warranties for these are all over the place. Most of them are 1 year but we did find one that has a lifetime warranty. Make sure you know what your warranty covers and, more importantly, what it doesn’t. Now that we’ve gone through the features in our ultrasonic cleaner buying guide, let’s move along. Next up, you’ll find a variety of things, including one ultrasonic gun cleaner review. If you’re in a hurry, start with our top and budget picks. They’re right at the top of the list. But keep reading if you can, our list includes a variety of different products that you really should check out. Alright, let’s get started! Ready? Let’s go. 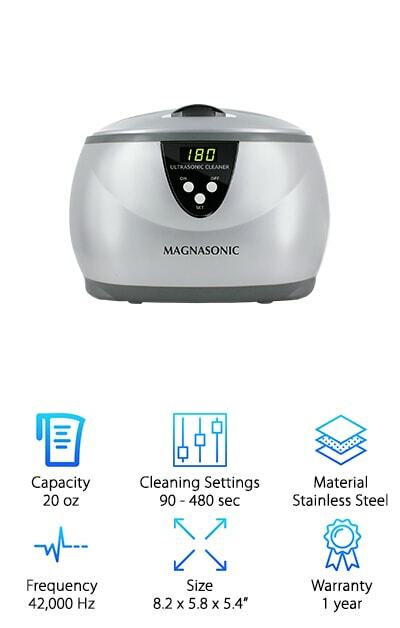 Our top pick for best ultrasonic cleaner comes from Magnasonic. It’s the perfect size for jewelry, watches, or eyeglasses. All you have to do is fill the tank with water, turn it on, and you’ll get professional level results. Even though it might not look like much is happening, the 42,000 Hz of vibration create microscopic bubbles that lift dirt without any harsh cleaners or chemicals. If you want to get things extra clean, you can add some hand or dish soap but it’s not necessary. The thing we like most about this one is the large tank. It can hold 20 oz of water and clean a lot of things at once. That saves you time and gets rid of more dirt. For the best ultrasonic jewelry cleaner on a budget there’s this basic Generic Wave Jewelry Cleaner. It has a large 20 oz tank, perfect for your jewelry, utensils, and dentures. And the best part is you can get professional level results using only tap water. The ultrasonic action removes everything from rust to grime to fungus and gets your belongings truly and deeply clean. And it doesn’t use any chemicals to do it. One of the things we really like about this one is the clear cover and light. You can peek right into the top of the machine as it cleans and watch firsthand as the sparkle and shine returns to your precious items. One more thing, we really like the compact size of this machine. 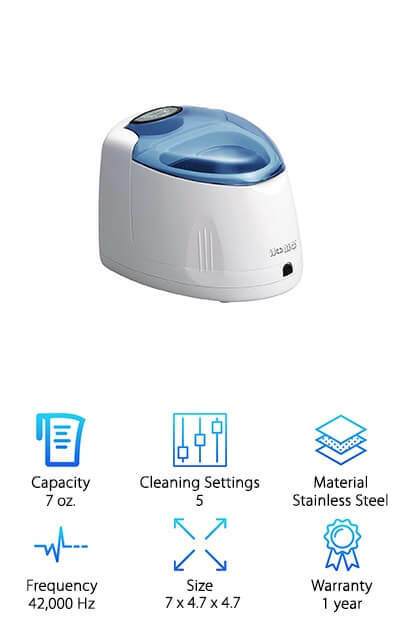 If you’re looking for the best ultrasonic denture cleaner, we suggest the iSonic F3900. It’s not just a good pick for dentures, it’s also perfect for mouth guards and retainers, too. So, what makes it such a great fit for these things? It’s all in the tankIt has a perfect capacity at 7 ounces - because it was designed to be the perfect size for your dentures. The curved D-shaped tank holds them perfectly without too much room for them to wiggle around. For daily cleaning, add half an iSonic AlignClean tablet to the water. To remove stains, add half a teaspoon of iSonic White denture cleaning powder. That's it! This produtc will get your old dentures looking like new again in only 15 minutes. Next up in our isonic jewelry cleaner reviews is a machine that comes from Famili. It’s large 20.3 oz tank has a nice, wide interior so is can hold larger items easily. One of the features that we really liked about it was the small basket that comes with it. If you want to clean smaller, more delicate things like your jewelry, it keeps them a little more contained than letting them go around the whole tank. It also has a really cool watch holder that positions the band for optimal cleaning. This one has 5 preset cleaning cycles that range from 90 to 600 seconds and it automatically shuts off when it’s finished. You can either use plain water or add some cleaner particularly icky items. 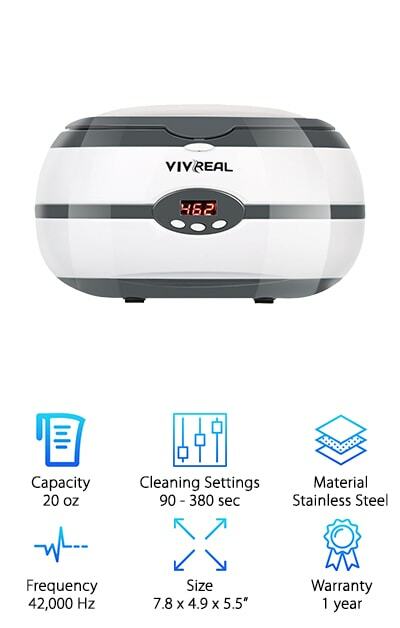 Our pick for best digital ultrasonic cleaner is from Vivreal Home. One thing that makes this machine unique is the special degassing function. What exactly does it do? It’s a mode that you can use when cleaning certain metals that can protect them from oxidation or other chemical reactions during the cleaning cycle. This one also has a digital display where you can choose from one of the 5 different presets cleaning cycles. The 20 oz tank is large enough to fit bigger items but the footprint is small enough that you won’t have any trouble finding room for it on your countertop. Plain water will work with most things. The manufacturer does recommend adding some detergent for anything that’s particularly greasy. If you found yourself here because you’re looking for the best ultrasonic gun cleaner, you’re in luck because here it is. 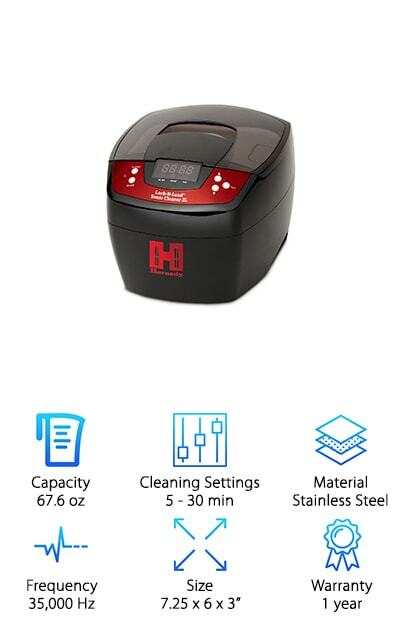 The Hornady Lock-n-Load Sonic Cleaner features an 80 watt ceramic heater that makes it a little easier for the machine to get gun parts really clean. Want to know what else is special about it? It has a large 2 liter tank. It’s so big that it can hold an impressive amount of 223 cases. How many? 300! Now, that’s a big tank. If you want to get things even more clean, add some cleaning solution to help remove any carbon residue from cartridge cases or any other small metal pieces. One more thing, you can set it to run between 5 and 30 minutes. When looking for ultrasonic cleaners Amazon has a lot to choose from. 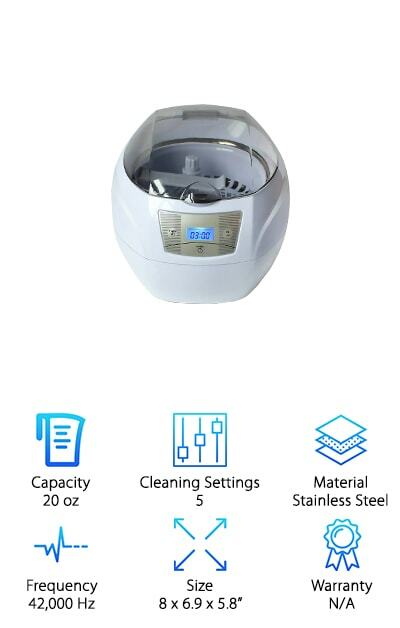 But we wanted to make sure that you didn’t overlook the Life Basis Ultrasonic cleaner so we knew we had to include it in these jewelry cleaners reviews. The large 25.3 oz tank is a bit bigger than other machines meant to clean jewelry, eyeglasses, and more. What does that mean for you? You can fit even more of your items inside and clean more items per cycle. There are 5 presets on this one ranging from 90 to 600 seconds, or 1.5 to 10 minutes. And guess what else? It even comes with a basket to secure your smaller more delicate items before your start the ultrasonic cycle. 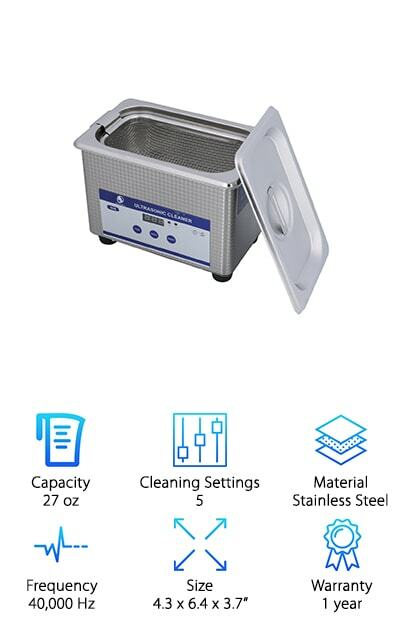 If you have, like, a lot of stuff you want to clean or if you want something that will deliver commercial level performance, you have to check out this VEVOR ultrasonic cleaner. What makes it good for these kinds of things? For one thing, the tank is huge. 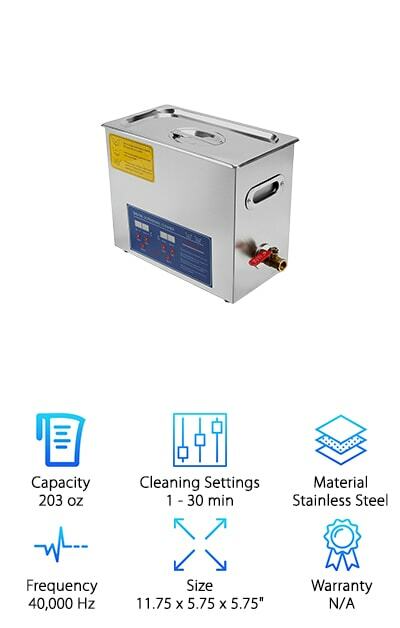 This is a 6L ultrasonic cleaner. That’s 203 oz of water. Another great thing about it is that it includes a heater which makes the cleaning process a little easier. It works great with just water but you can definitely add some cleanser if you’re working with some particularly stubborn stains or dirt. There’s also a timer that you can set for 1 to 30 minutes. Oh, and the temperature is adjustable, too, from 0 to 80 degrees. 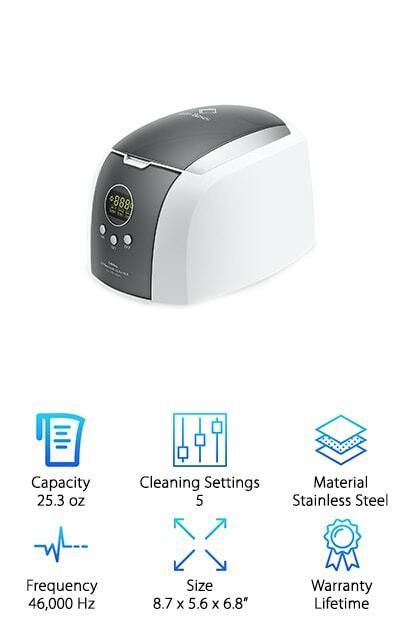 Up next in our ultrasonic jewelry cleaner review is this machine from Skymen. 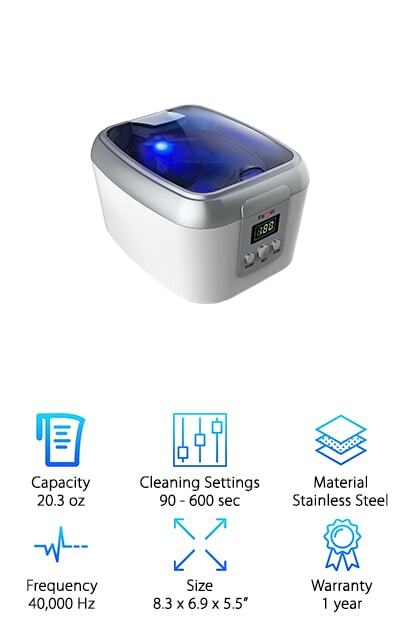 Although this one has a larger tank size than some of the other machines, we still consider it a pretty small ultrasonic cleaner because it really doesn’t take up that much room on you counter. We like that it comes with some useful accessories, too. The small plastic basket is the perfect way to clean more delicate items like jewelry. It keeps them contained in the large tank. The watch stand is great, too. This allows you to position your watch so that the face is raised slightly out of the water to prevent any damage. It also helps the cleaning bubbles get into all the small nooks and crannies in the band. 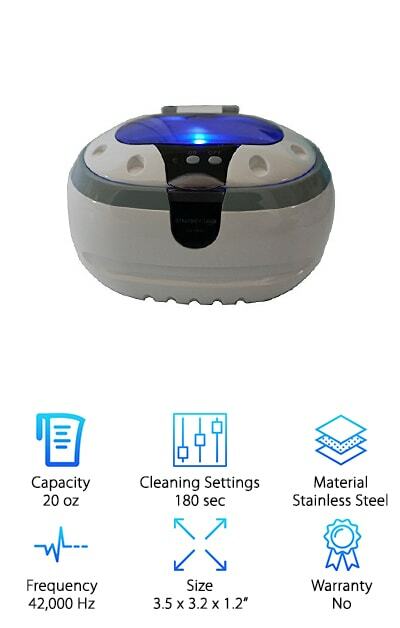 One of the things we really like about the Thinp Ultrasonic Professional Cleaner is the large, transparent lid. You can look right into the tank as it’s cleaning. There’s a really nice digital display, too. From there, you can choose from one of the 5 preset cleaning cycles that range from 90 to 450 seconds. It’s so easy to use, just choose how long you want the machine to clean. It’s really easy to use and the automatic shut off will kick in when the cycle is complete. This is a great machine to use at home but it’s large enough and tough enough to be able to handle commercial applications as well. Best of all, it’s effective using only water but you can add cleanser for extra cleaning power.